Download the upgrade file for the Meter by clicking the above link. Connect the USB cable to the PC or laptop. Make sure the Meter is off. Simultaneously push and hold Setup button and > button as you connect the other end of the USB cable to the Meter. The Meter boots up in the firmware upgrade mode and stays on while it is connected to the PC. Identify the external disk that is the Meter in an Explorer window on the computer. Make a copy of the upgrade file to the external disk that is the Meter. Right-click on the external disk and select eject. Disconnect the Meter from the host PC - to prevent database corruption problems, always use the “Safely Remove Hardware” option before unplugging the USB cable. When you eject a device (like a USB drive or the 805 FC), Windows will tell you when it's safe to remove, ensuring all programs are done running. Trending vibration measurements over time is the best method to track machine health. 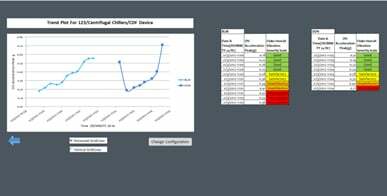 Import measurements from the Fluke 805 Vibration Meter to an Excel template on your PC in order to trend the bearing parameters: overall vibration, CF+ and temperature. The user can now see a clear picture of the changing bearing condition and deteriorating health of the machine.